PDMS chips, soft lithography … Do it yourself ! Considerably when it is polyester film-made, and to a lesser degree when it is glass-made. Those dimensional changes of the photolithographic mask will lead to dimensional changes of your microfluidic channel. For some microfluidic applications small changes in the microfluidic channel size can lead to strong changes of your fluidic resistance. The dimensions of a film photolithographic mask will change under the influence of 4 factors: changes in temperature, changes in humidity, mechanical tensions and aging. Some dimensional changes are reversible, whereas others are not. The dimensions of a Glass photo-mask will only change with two of these factors; temperature and mechanical tensions, so movement due to humidity is avoided. Because humidity is probably the hardest of these 4 factors to control adequately – and also has the biggest influence on dimensional changes – Glass photolithographic masks would always be the recommended product if you need to control the accuracy of the mask to critical dimensions. Film is made up of a polyester base with a thin layer of gelatine on its surface. Both the polyester and the gelatine absorb moisture from the air. The more water they absorb the more they swell (size increases). Respectively, they shrink as they dry out. The moisture content of the film will gradually adjust to the moisture content of the air (known as Relative Humidity RH). RH represents the amount of water that air can hold as a percentage at that particular temperature before condensation appears. Most materials expand with increasing temperatures, and films and glass photolithographic masks are no exception to that rule. The dimensions of all masks in use today change with changing temperatures. The expansion is determined by CT, the thermal expansion coefficient. CT is a basic characteristic of a material; it is expressed in mm per metre per degree Centigrade and shown in the above table 2. Polyester based film photolithographic masks change rather fast when the temperature changes. The time constant for temperature changes (the time needed to reach 2/3 of the total change) is a few minutes. Glass photolithographic masks have a much larger time constant due to their higher thermal mass. A polyester based photolithographic mask will reach its new size in about ten minutes when the film is exposed to the environment from both sides. Polyester film absorbs water and thus expands with increasing relative humidity. The expansion is determined by the CRH ( relative humidity expansion coefficient). CRH is expressed in µm per metre per % change in relative humidity. If the CRH of a material is 1, one metre of that material will expand 1µm when the relative humidity increases by 1 %. Likewise the material will shrink as the relative humidity decreases. Silver halide film masks react in a more complex way to changes in relative humidity. The dimensional change is partly caused by the influence of the gelatines and partly by the influence of the polyester. Remember, humidity only affects our polyester film masks, and not our glass based masks. The gelatines on the film base have a time period for relative humidity changes of only tenths of a second: they act like a sponge.They absorb and desorb much water and do so extremely fast. However, the polyester base has a time period for relative humidity changes of several hours: it absorbs or desorbs only a little water and does so very slowly. Please note: Humidity distribution in a room is rarely homogenous – that is, it can change from area to area, and from corner to corner. It is vital if you are trying to control the humidity environment to ensure that air flow is constant throughout the WHOLE room. Any film mask will expand to a certain extent under the influence of mechanical tension. The size of silver halide masks may change with aging. Over time, there is a tendency for the film to change back to the initial size it was prior to processing. These changes can take several months, and are relatively small, but this gives another reason why it is critical to control and maintain processing conditions. Hysteresis is a phenomenon where irreversible dimensional changes occur with film photolithographic masks when the relative humidity has been below 30% or above 70%. At higher relative humidities, irreversible dimensional changes occur due to recovery. At lower relative humidities, irreversible dimensional changes occur due to relaxation. When a film is brought into an environment with a RH higher than 70%, the gelatines become so wet that they loose strength. One could say that the gelatines chains are separated by so much water that they loose contact with each other and cannot apply their influence any longer. The effect of the gelatines on the dimensional changes becomes weaker, and as a result the film expands less. This loss of length increase is permanent. Even when the RH of the environment will later return to below 70%, the film will remain shorter. This phenomenon is called recovery. When a film enters an environment with less than 30% RH, the gelatines loose so much water by evaporation that the gelatine chains touch one another. Hydrogen bridges are formed between the gelatine chains and these absorb the mechanical tensions the gelatines would otherwise apply to the polyester. As a result, the effect of the gelatines on the dimensional change weakens, and the film shrinks less. This loss of shrinkage remains, even if the RH of the environment rises above 30% again. This phenomenon is called relaxation. There is little worry with irreversible changes based on temperature. At temperatures above 60°C the polyester starts to deform. These deformations are permanent and very obvious! As long as the film is then used in the very same conditions in a production environment, there will be no problems with dimensional changes due to fluctuations in temperature and/or humidity. To maintain accuracy, we also store and image our glass photo-masks in a controlled environment. Approximately 50% of the dimensional change of a silver halide mask due to fluctuations in relative humidity happens within a second. This is due to the gelatines. The remaining 50 % of the total dimensional changes take litterally hours and hours. That’s why we recommend waiting for eight hours for a film to be acclimatized after a change in relative humidity. This timing is only valid when the film is exposed to the environment from both sides. Coincidentally, polyester film only takes a few minutes to equilibrate with changes in temperature. Prior to using the film in a mask aligner (or similar equipment), it should be acclimatised for 8 hours in an environment of 21°C and 50% (the standard conditions that are also applied in imaging). During that time, the film can get at the right conditions without any humidity exchange. Then when the film has fully acclimatized, it may be used without any dimensional inaccuracies. 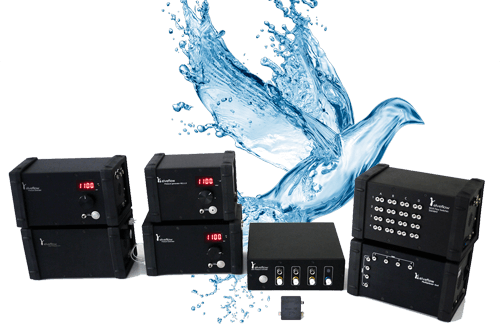 Come to discover the Elveflow microfluidic product line. Please refer to “Microfluidic reviews and tutorials”.